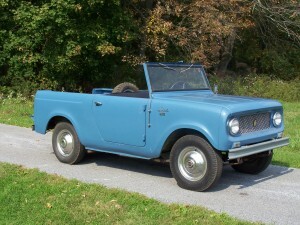 PLEASE READ: IHScout.com has some of the largest inventory of IH Scout and Truck parts in the country. We strive to provide our customers with the best hard-to-find parts we can get. We literally scour the country gathering IH parts and vehicles. There is a tremendous amount of labor involved in this process. Delays may occur! If you are placing an order with a strict deadline for delivery date, we urge you to call us first to confirm parts availability and shipping/delivery date!!! We encourage our buyers to ask questions before placing an order! We want to make you a satisfied (and ultimately a repeat) customer! Used parts have flaws and we are humans, mistakes are made! New parts are often made in very short quantity runs and often from other hobbyists who have reproduced these parts and made them available to us! Again, this can be a contributing factor to shipping delays! Please read our return policy and report any issues with an order within 48hrs of receiving it! Family Owned IH Dealer since 1952! 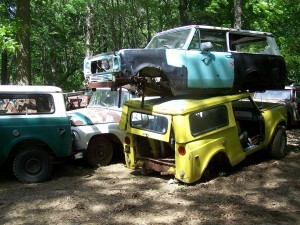 Our salvage yard (Only IH) has numerous IH Trucks and Scouts of all years being brought in a parted out. Call us with your needs!